Look around you today. Who runs this world? If you said Satan you are correct. Just look at the majority of people walking around. They have that walk that says look at me I'm a god, I am superior to everyone around me. Look at my tight clothes or lack there of. Look at my super nice hair cut, look at my shapely body/over weight hanging out all over the place body. Look at my expensive watch/jewlery. Watch me strut up to my very nice vehicle that I can barely afford. Look at me I am drowning in debt trying to keep up with worldly trends and fashions. The suffering is worth it though because it makes me look good like a king or a god. Worship me with your eyes, lust after me, and covet what I have so that my selfish needs and desires will be filled. James 5:2,3 Your riches are corrupted, and your garments are moth eaten. Your gold and silver is cankered, (corrupted, decayed, eaten away) and the rust of them shall eat your flesh as it were fire. Ye have heaped treasure together for the last days. 2 Timothy 3:1-5 This know also, that in the last days perilous (dangerous) times shall come. For men shall be lovers of their own selves, covetous, (greedy, grasping) boasters, proud, blasphemers, (ones who curse) disobedient to parents, unthankful, unholy, without natural affection, truce breakers, false accusers, incontinent, (unable to contain or restrain oneself) fierce, dispisers of those that are good. Traitors, heady, (rash) high minded, (arrogant, proud) lovers of pleasures more than lovers of God. Having a form of godliness, but denying the power thereof from such turn away. Does this happen in the Seventh Day Adventist Church? Unfortunately yes it does, it happens way to much these days. If you want to break the 10 commandments, its easy to do, just go to your local SDA church. There you will instantly commit adultery with your eyes and thoughts. You will also do a lot of coveting if you don't have the nicest of the nicest at your church. Most of us have forgotten what it is like to be humble. We walk around like spoiled brats. Do you know who I am? My father is God. I can do whatever I want because my father will bail me out of trouble with no consequences. So we walk around with our heads held high and stare down anyone who looks at us and doesn't quickly turn their eyes away. People want to be the center a\of attention. They want people to see their stuff but in the same aspect they get upset if they catch you staring at them. They like to pretend they don't like the attention but in return they do like it or they wouldn't flaunt their assets around. John 15:18-20 If the world hate you, ye know that it hated me before it hated you. If ye were of the world, the world would love his own: but because ye are not of the world, but I have chosen you out of the world, therefore the world hateth you. Remember the word that I said unto you, the servant is not greater than his lord. If they have persecuted me, they will also persecute you, if they have kept my saying, they will keep yours also. Wanting to look good to others, turn heads, have people chase after you, have people want to be you, or want to have what you have is wondering after the world. So does the world love you or does the world hate you? Do you get along with everyone in the world? Or do most people look at you like your dirty or nasty? Do people love to talk to you about worldly things or do most of them leave you alone because they look at you as a holy roller, Jesus freak? Do people know if they try to talk to you about worldly things that you will always refer to the bible about the problems the world is having? Do people in your own church keep their distance from you because your not in the latest trends? Do you look at Hollywood stars and wish you could be like them? Does Lots of money, being popular with the big names of the Hollywood world, and everyone everywhere knows your name make you nod your head? Or do you look at your pastor or someone who has an apparently close relationship to God and want to be like them? Who is cool in your eyes? The person with everything or the person that seems happy all the time because he shines with the presence of Jesus? You can't have it both ways. Would you rather live in a shack/trailor park being dirt poor and having a very close relationship with Jesus Christ, or would you rather have everything this world has to offer and have no or little time for Jesus. Because you have time sucking things like IPODS, Plasma TV's with 300 plus channels, fastest newest laptop with the fastest Internet available, Sony PSP, PlayStation 3, Xbox 360, Fastest car with the best sound system, and the nicest motorcycle ever made. Man with all that stuff who has time to pray or study the bible? You will spend/waste more time with that worldly treasure/idols than you will with God. Don't be fooled into thinking God is happy with a 5 sec prayer or a 5 min prayer as you lay in bed with your brain tired and worn out when you mumble off a prayer as you fall asleep. He wants a relationship with you. He doesn't want to be last in your life after all the worldly things. He wants his people to have Him and his Law on their minds all the time to help fight Satan's temptations off. Its hard to fight Satan when your busy reading a romance novel or wasting your time playing shooting games on the Xbox. Judgement day is just around the corner and many Christians will be weighed and found wanting on all the time they selfishly wasted when they could have been getting closer to God and aiding him in his war against evil by spreading the gospel. Being a church member lately is like being a member of a club. People show up to socialize but rarely do anything in God's name. They show up for their 1 hour or 30 min church day to see how everyone is doing and get the latest gossip. Then they go out to eat and make their maidservants work for them on the sabbath. Or maybe make a quick trip to Wal-mart and buy a few things for sabbath lunch, thus making their maidservants work for them again. Most people don't have time to read their bibles because the worldly things are more important. Do you walk around at your job thinking of current events and how soon Jesus will be here? Do you walk around your Job humming a hymnal song out loud or in your head? Do you talk to Jesus in your thoughts a few times while driving to work, or on the job thanking him for little things or just asking him to forgive your many sins? Look at these SDA single sites or SDA Facebook pages. How many of them look humble or even look like they have a relationship with Jesus? How many of their pages look like everyone else's pages, full of worldly things and wants. The only mention of Jesus is in their religion status that may read Christian. But then again so does the majority of the people on MySpace. To me it looks like the SDA/Christians are representing the club they belong to. The worldly club. I see SDA women on Facebook barely covered up trying to post the most sexual pictures they can get away with to attract a worldly man. I see on men's pages pictures of their prized possessions and pictures of them not having a humble attitude at all. They also look like your average worldly person. None of them stand out they blend in with the worldly trends. What is popular in the world, most of our flock is going along with. I don't even see Jesus going to MySpace due to the graphic advertising that you see just logging onto your page. You have women barely dressed selling you all kinds of stuff. John 17:14 I have given them thy word, and the world hath hated them, because they are not of the world, even as I am not of the world.James 4:6 But he giveth more grace. 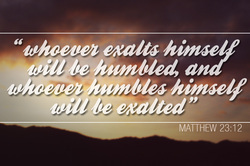 Wherefore he saith, God resisteth the proud, but giveth grace unto the humble.1 Peter 5:6 Humble yourselves therefore under the mighty hand of God, that he may exalt you in due time.Luke 14:11 For whosoever exalteth himself shall be abased; and he that humbleth himself shall be exalted. Matthew 18:4 Whosoever therefore shall humble himself as this little child, the same is greatest in the kingdom of heaven. Psalm 25:9 The meek will he guide in judgment: and the meek will he teach his way.